Photograph depicts Moran standing to right of unidentified woman. 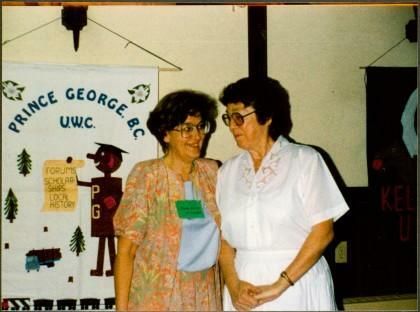 Banner hung in background reads: "PRINCE GEORGE B.C. / U.W.C / FORUMS SCHOLARSHIPS / LOCAL HISTORY". Photograph taken during a three day meeting of the B.C. Council of the Canadian Federation of University Women, to honour the 25th anniversary of the Prince George club, and release the new edition of their book 'Prince George Street Names: Our History'. Item is part of the Bridget Moran fonds. See also items 2008.3.1.16.9, 2008.3.2.4.2 and 2008.3.2.4.3 for images featuring similar content.